After the revolution of 1848, the French art critic Charles Blanc (1813-1882) was for some years Director of the Department of Decorative Arts at the Ministry of the Interior in Paris. After a political career, he developed an interest in art, and in 1881 presented his Grammaire des arts décoratifs which was widely read by artists who included Gaugin, Seurat and van Gogh. Blanc’s writings are considered the most influencial texts on colour theory to come from the second half of the 19th century. In 1879, two years before the publication of his Grammaire, Blanc designed a colour-system based on Chevreul’s «laws of simultaneous contrast». A few ideas were also borrowed from the painter Eugène Delacroix, who had attempted to put Chevreul’s theory of contrast into practice. For Delacroix, half tones — which for him are the dominating principle of painting — do not occur as a result of the pure colours being mixed with «dirty-making» black, but because neutralising complementary colours are used. 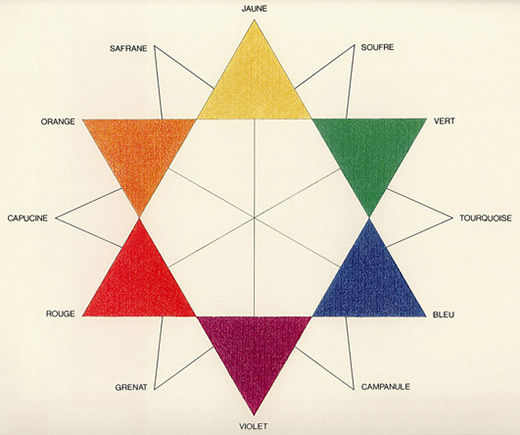 To outline his ideas about colours, Blanc took an equilateral triangle with yellow, red and blue at its corners and violet, (between red and blue), green (between blue and yellow) and orange (between yellow and red) on its sides. Hence, Blanc constructs his colour-circle from triangles without including black or white — three chromatic triangles, therefore, one for each of the additive primary colours red (rouge), yellow (jaune) and blue (bleu) and one for each of their complementary partners orange, green (vert) and violet (violet) (illustration geometric variations). The mixed colours are characterised by reference to both materials and objects: garnet red, capuchin, saffron, sulphur, turquoise and campanula. If orange is included, there will be four independent colour-terms, and these correspond to Hering’s psychological primary colours. Before his Grammaire des arts décoratifs, in 1867 Blanc had written a Grammaire des arts du dessin (Grammar of Painting and Engraving) in which he regarded colours as the «feminine» component of art, subordinate to the «male» of the drawn line. Although the artists amongst his readers apparently had little idea what to make of this distinction, they did support other ideas; van Gogh, for example, was fascinated by the dynamics of complementary colour pairs. Blanc had described complementary colours as victorious allies when they appeared side by side, but mixed together he saw them as deadly enemies. Van Gogh subsequently used them in his pictures to portray «struggle and antithesis», as he describes it in letters to his brother Theo. Blanc’s main writings appeared in about 1880 at a time when a new dialogue between the worlds of art and science was beginning. The heyday of Impressionism was drawing to a close. In the following years the Neoimpressionists would attempt to provide a more scientific basis for impressionistic colours under the leadership of Georges Seurat. They had an abundance of material available to them — including the works of Herman von Helmholtz (whose Manual of Psychological Optics had by then appeared in French) and Wilhelm von Bezold’s texts, which were published in French in 1876. Seurat and his colleagues had begun to feel that, if they did not become more involved in a science which could explain the optical effects which formed its basis, art would remain intellectually unsatisfying. His task was made easier by the work of the physicist Nicholas Odgen Rood, who was also an accomplished painter. Date: The French art critic Charles Blanc examined colour contrast in the years around 1879. Bibliography: Ch. Blanc, Grammaire des Arts du Dessin (English edition: The Grammar of Painting and Engraving, Chicago 1879); Color Documents: A Presentational Theory, organised by S. Wurmfeld, Hunter College Art Gallery, New York 1985.